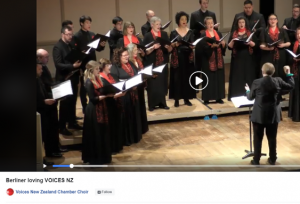 VOICES NZ European tour a resounding success - New Zealand Choral Federation Inc. In October this year, our premier national choir, VOICES New Zealand, headed overseas for a 6-centre, 4-country whirlwind tour of Europe. Directed by Karen Grylls, the choir was joined by taonga pūoro exponent Horomona Horo for works ranging from Hildegard of Bingen through to contemporary New Zealand composers Victoria Kelly, David Hamilton, Helen Fisher, David Griffiths and David Childs. An undisputed highlight of the tour was performing Victoria Kelly’s The Unusual Silence at the centenary of the liberation of Le Quesnoy in Northern France by New Zealand troops. Less than 24 hours after landing at Heathrow, conductor Karen Grylls, vocal coach Catrin Johnsson and the choir members threw themselves into rehearsals for a concert two nights later as part of the prestigious Choral at Cadogan series in Cadogan Hall, Sloane Square. The choir was thrilled to see a poster for the series showing VOICES NZ sharing the billing with The Sixteen, The Tallis Scholars and Voces8! This first concert of the tour was recorded by BBC Radio 3 and will be broadcast on RNZ Concert on December 13th. As for the rest of the tour, Choirs Aotearoa New Zealand CEO, Arne Hermann writes: The tour unfolded like a dream. Emma’s logistics were spot on, Karen’s conducting out of this world, Horomona’s sounds authentically ethereal and the voices of the singers divine – and audiences all over Europe ‘got it’. There were tears in Le Quesnoy, bravos in Germany, standing ovations in France and utter amazement in Barcelona. VOICES NZ took our stories and our music to the world, and the world learned about Aotearoa and its people.